A 25 mile bike ride today. What is so great, is that in the end when you finally arrive at your destination it feels so good. 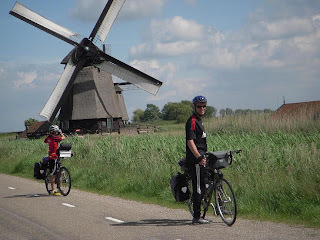 It is euphoric, the tired but good feeling of cycling and all the things you saw and experienced along the way. Let me say this: we are sleeping really, really well. 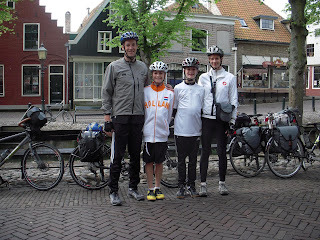 We took our time, shoved off from Edam with a basket full of croissants and lunch baguettes. The sky was clear and the temperature pleasant. We passed cows, sheep, swans and goats. And I notice after passing quite a few fields, that late spring shows itself in all the little newborns. 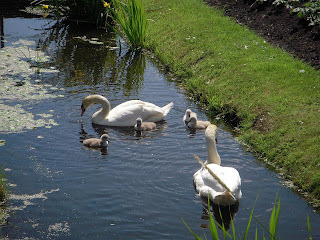 We see baby sheep, baby ducks, baby swans, baby cows and on future rides added baby rabbits, baby chickens, baby horses. Spring is in the air; and we are happy. We stopped for a picnic break along one of the canals, and spent over an hour in a perfectly quaint little town, De Rijp. Caleb and Anthony juggled in a tiny square, James read his book and I took a brisk walk to case the place. A few photos and a present-for-mom later, we were back in our saddles, ready to roll. We arrived in Alkmaar, and landed in our little hotel (no wi-fi again; it has been about 5 days of no wi-fi and Internet cafes only allow you to use their public computers. James is researching options). We walked into town, walked a few streets, enjoyed a nice Greek dinner and then back to the hotel where we all slid into sleep quite readily. it makes me think of you. so glad we brought that. No Doubt: Go See Van Gogh!